New items can be added from the main screen or from an open item card. Use the "+" icon in the bottom right corner on your Android phone or in the right top corner of you iPhone. By tapping the icon you will trigger another icons. Tap the round icon of a required item. If you want to create photography or journal, just push and hold your finger on the icon of eWay-CRM Mobile. You will see menu as in the picture below where you select what item you want to create. If you tap the New Photo icon, the camera of your phone will turn on to take a picture immediately. If you tap New Journal or New Document icon, new window will appear as in the picture below. Contact: the Contact field and the Company field (if the contact has a relation with a company). Deal/project: the Superior Item field (name of a deal/project), the Сompany field and the Сontact field if the deal/project has relations with any of them. If you create a new item in the main menu, no fields will be prefilled. 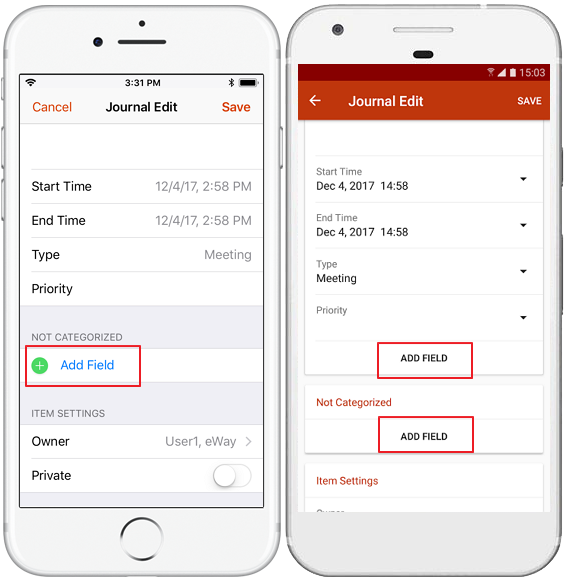 2 Mandatory fields are underlined with red color. 3 You can set reminders by tapping on the toggle and selecting the date. The reminder will appear in both eWay-CRM and in the Outlook Task list. Except the default fields, you can see also all custom fields you have related with the module and you can fill them during adding new item. There are only default fields displayed but you can add others by tapping Add Field and select fields you need. Once you filled in all values, tap SAVE in the top right corner of the screen. 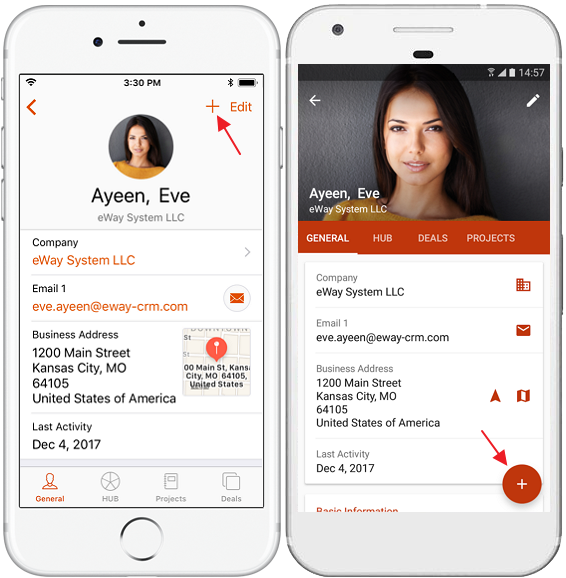 If you are online, new records will be saved on your phone and synchronized with the database so that your colleagues will be able to see them in their eWay-CRM - both on computers and on mobile phones - immediately. If you are offline, new records will be saved on your phone and will be synchronized with the database once you get online. In any case, new records will be available right away under the HUB tab of a correspondent company, contact, deal or project. 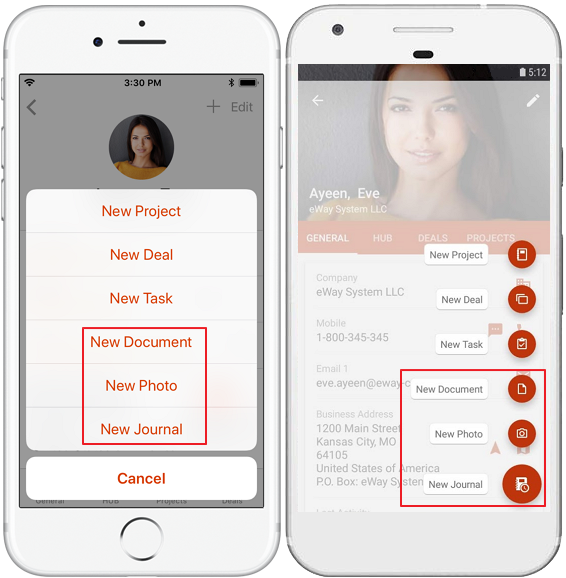 On your PC, new photos and documents will be under the Documents tab and new journal will be in the Journal tab of the project/deal, company or/and contact they are related to. 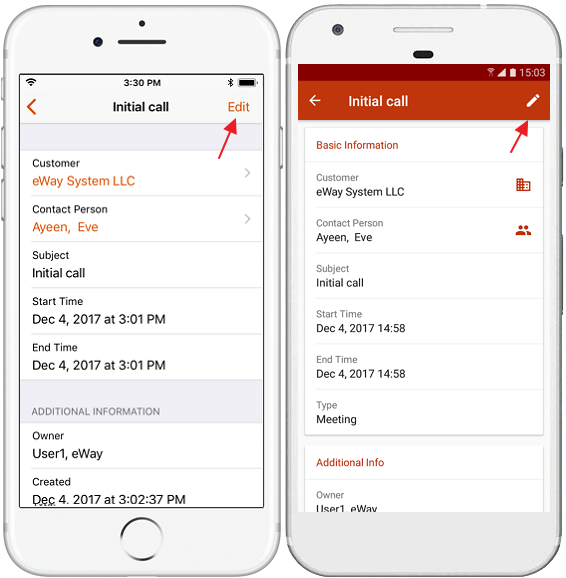 Saved item can be also edited in eWay-CRM Mobile. User can always make some corrections, add new values to an item. 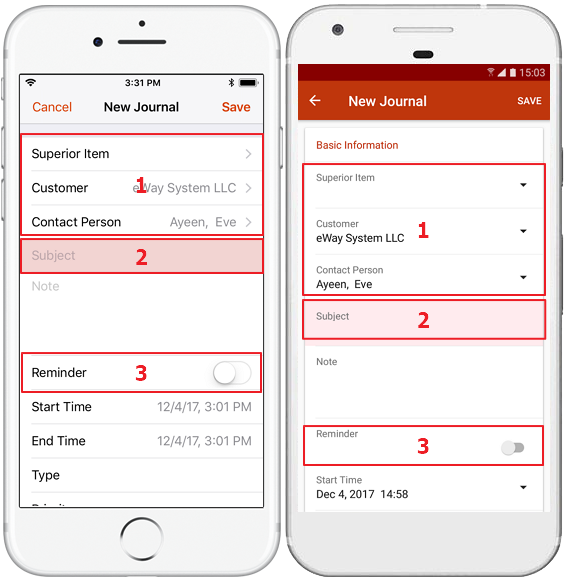 See the table in article eWay-CRM Mobile Introduction to have a list of items that can be edited. 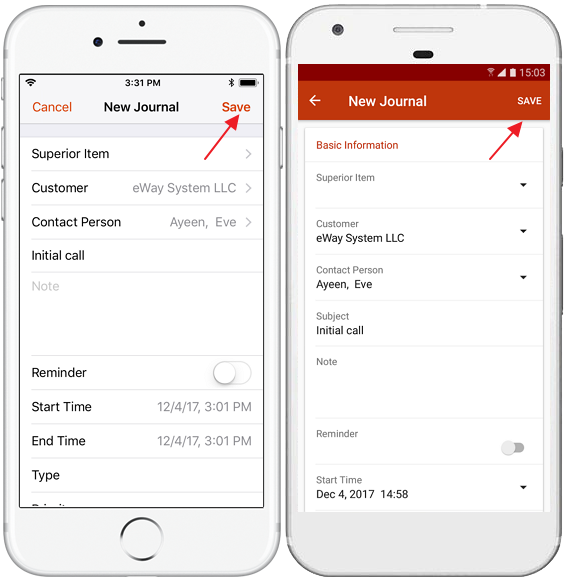 If you want to edit the item, open it in eWay-CRM Mobile and click the edit icon in the top right corner. If you click the icon, you can edit all available fields. As soon as you are done with editing, save your changes.